We are an exclusive design studio creating innovative legwear for women. We take the beauty of the leg and frame it with our live art work based in orthotics. the ladies who love their black patent leather heels. 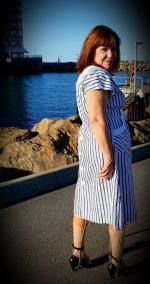 Its a beautiful autumn day in South Australia inspiring Clarise to wear one of her perfect retro outfits with her cute little white slingbacks with of course her amazing leg braces. 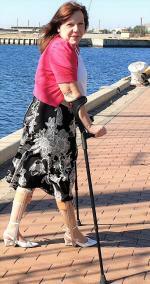 She crutches along the wharf at the old Port River docks in suburban Adelaide SA. maryjanes and a kafo brace on her left leg and an afo on her right leg to help with the number of steps she encounters around the marina. walking shoes and her stunning legbraces. Enjoy the day out with her and support her hard work making her way around the undulating memorial park. Wait for her meeting a famous old steam train again as she brings her clip to an end. Clarise takes a trip to a local lake under the flight path of the Adelaide airport to avoid the holiday crowds at her own beachside suburb. Her wedge boots teamed up with her legbraces and a cute little summer outfit make it an interesting little clip. Take a ground level look at Clarise' stunning peticoat and upper brace straps. Her little pink and white heels push down into the soft ground under the swing. 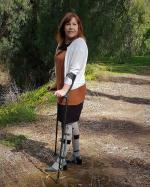 Join Clarise in an afternoon crutching in her local park. She takes time to describe her retro outfit and her commitment to reloved shopping. She enjoys a swing despite the restriction of her delightful legwear and heels. Not to be deterred from her life outdoors Clarise bandages her swollen ankle and looks for a new venue to shoot her next legwear video. 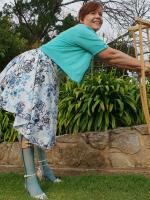 She can still entertain with her famous wooden crutches. 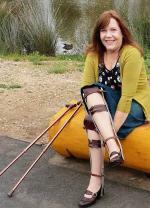 Clarise is back in her wheelchair for an early morning beachfront roll wearing her vintage boots with her braces. 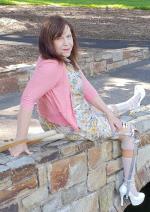 She then decides to headup to a new parkland facility to practice her swing through crutching on her delightful old wooden crutches. 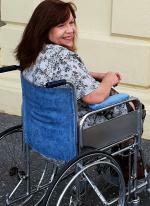 A beautifully restored 1960s wheel chair is Clarise’ latest acquisition. 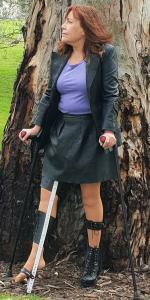 Watch as she takes it for its first outing wearing appropriate 60s skirt, top and classic maryjane shoes dutifully attached to her timeless legbraces. Clarise charms every one including the camera man as she meets up for a photo shoot. 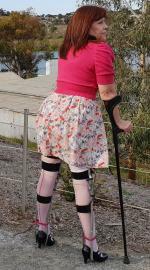 She wears her pink booties with her new pink crutches and keeps her pink straps on her braces. It's a windy cold day, unusual for Australian springtime. Clarise puts her new pink stockings with her all black outfit and visits the beautiful Torrens River and University bridge. 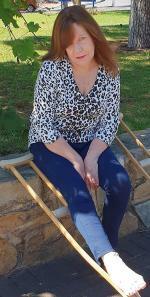 She negotiates the bike tracks and linea park walking trails including a couple of sets of steps. Wearing a classic pair of black patent leather maryjane heels attached to her braces, Clarise climbs a long walking trail through a delightful garden. 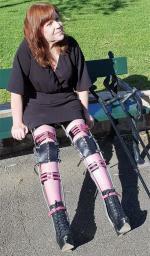 Her brace straps are in pink to coordinate with her pink outfit.